Disability Awareness Series Part 4 | Dogs really do change lives! Many of my readers will already be aware I am currently writing a disability awareness series to help you guys have a bit more of an insight into my life and the real problems disabled people face everyday. We have found so many furry friends including the great Blacky the Wheelchair cat. Over on his page Facebook page they are also doing a disability awareness week to help raise awareness of disability. We decided together it would be great for me to write a guest post that I would help to raise more awareness of my disability. As well as tell my story of what it is truly like to be disabled and how one small little dog has changed my life. Having a disability I feel is sometimes quite an odd concept to understand. Even just the word disability labels me on the things I simply cannot d and how my ability to carry out those activities is hindered. What astonished me most is we don't judge or label 'normal' people on what there ability level is. When you meet someone new you don't introduce them as ' Hi, this is Scott and he can't play the piano'. It just sounds silly and in fact pointless, why would I need to know that about him anyway. Well I feel the same about my disability, I don't want to be labelled on the things I cannot do, I'm just Jessica, nothing else just me! This in my eyes has evolved a whole new culture that looks at disability from the wrong angle. I have a disability called Osteogenesis Imperfecta (Brittle Bones) which basically just means my bones are more fragile than most, as a result I have to use a wheelchair full time. Throughout my life I have faced an awful lot of discrimination. When people see me in the street they don't see me they just see my wheelchair and assume I either can't communicate or don't have the mental ability to do so and simply either ignore me or talk to the person that is with me and thus am sitting there thinking 'Helloooo I am here, I can hear you and I can talk!'. This is where Lottie comes in, I will admit I never quite expected the reaction to alter so much! 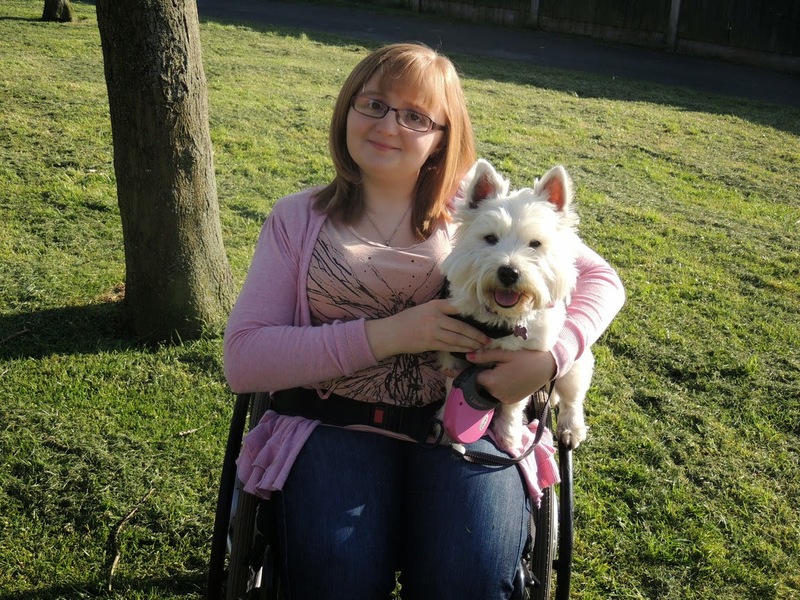 People now just see me as a fellow dog owner instead of a wheelchair user. They come up and talk to me, let the dogs say hello and then we both carry on our normal day to day life, just like everybody does! I have always wanted a dog, and finally got to get one on my 18th Birthday. Before then it was always a no from my parents and with good reason too, I had many lengthy hospital stays as a child and it was just simply unpractical. However as I grew older the hospital stays became less frequent , so that barrier was finally removed! I mainly wanted a dog for company, I have always loved animals as they don't judge or label. To Lottie I am just Jessica, not Jessica with a disability who uses a wheelchair She doesn't care about that I am simply just her mum. What I hadn't accounted for when I got Lottie was all the other aspects in my life that she could help me with, such as my confidence, the ability to open up a whole new world I didn't know existed as well as gaining me more independence by helping me around the house. Before having Lottie I would never of started a blog to help raise awareness of my disability neither create a Facebook page. The support I have received has been amazing and I thank you all so much. I have made so many friends not only online but also by attending training session with Lottie there again something I would never of done without Lottie. By attending these classing I have been able to train Lottie handy tricks that can help me around me house such as fetch my slippers and pick things up off the floor that I have dropped. Dogs brings something humans simply can't. It always been a saying I have great belief in, and that has certainly been the case with Lottie. I hope this post has given you more of an insight into my life with a disability as well as how dogs can really help those with disability. What an excellent and honest post, Jessica. You and Lottie make a great team! I am so glad you both have each other.